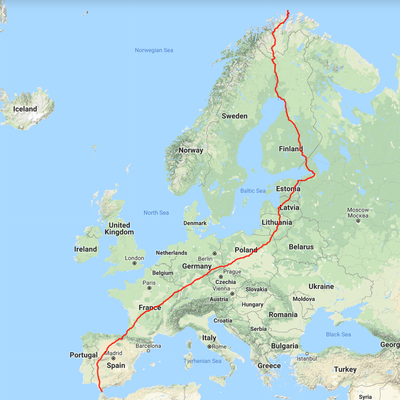 At noon, on midsummer's day 2019, I will set off from North Cape in Norway and cycle nonstop, overland to Tarifa in Spain. This 6300 km journey (around 4000 miles) will take me from Europe's windswept northernmost extremity, deep in the Arctic, to its scorching southernmost tip at the Strait of Gibraltar. The geographical logic of the ride is perfect - it's Europe's End-to-End: a route crying out to be ridden. The journey will take me through Norway, Finland, Russia, Estonia, Latvia, Lithuania, Poland, Germany, France and Spain. I will be trying to break the current world record of 21 days, 14 hours and 23 minutes. I also write reviews of cycling equipment for road.cc. Cannot display the map because inline frames are not supported by your browser or the web server. A 6300 km journey takes a lot out of your body. 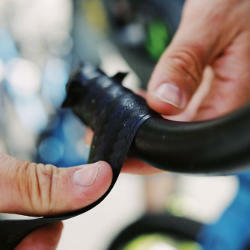 That's why I'm pleased Veloskin are supporting the ride with their excellent chamois cream and other skincare products. I used their chamois cream on North Cape 4000 and it got me through the whole event without any chafing - pretty amazing given I was averaging 360 km a day. Stayer is a small, independent bike company based in London, where they produce hand-made frames and wheels. Judith Stayer built the wheels I used to ride to first place in the North Cape 4000, and I'll be riding a set of her carbon wheels again for this record attempt. Highly recommended if you want a set of great custom wheels at a sensible price. Holly Seear, from Spring Cycle Coaching, has been central in arranging my training and fitness for this attempt. I'd trust Holly anyway, given her excellent qualifications and coaching experience. But perhaps more important is that she's been there and done it, taking part in all sorts of multi-day events herself. Guinness don't distinguish between world record attempts that are supported and attempts that are unsupported. So I could attempt this ride with a mobile home full of masseurs, mechanics and nutritionists following me the whole way. But that's not my style! I'm going to be doing this 100% unsupported, because that's what I know. 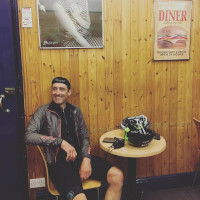 A few weeks after my attempt, UK rider Ryan Anderton is also riding from North Cape to Tarifa, taking the same route used by Lee Fancourt when he set the current world record. Ryan is raising money and awareness for the mental health charity Mind, and you can find more details on his website, Facebook page, and Instagram feed.